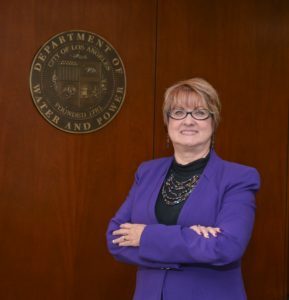 Reiko Kerr, Senior Assistant General Manager of Power System Engineering, Planning and Technical Services, is the first woman to head LADWP’s Power System. She co-leads the Power System with Andrew C. Kendall, Senior Assistant General Manager of Power System Construction, Maintenance and Operations. Kerr manages all aspects of the Power System’s critical engineering and planning functions including: generation, transmission, and distribution engineering, business development, renewable energy programs, and contract administration. In addition, Kerr is responsible for developing strategies to transition toward a sustainable energy future, improving public accountability, and developing the next generation workforce. When you first came on board, there was a lot of discussion at the executive level and at the Board of Water and Power Commissioners regarding gender equity at LADWP. Have you seen much progress in this area? When you look at the numbers and percentages of women in LADWP’s Power System they look okay—it’s at about 35%. But if you remove women in administrative and customer service positions, it’s quite different. Last year, we promoted six women to management. That was a 600% increase, but it’s a thin layer because we’re not bringing in new female employees. While it’s true that engineering and field jobs at LADWP are more often filled by men, this is an industry-wide challenge. The industry as a whole must do better. Mayor (Eric) Garcetti issued Executive Directive No. 11 regarding Gender Equity in City Operations to ensure the City’s governance is inclusionary and non-discriminatory for populations that have historically been underrepresented. General Manager David Wright has been and continues to be a strong supporter and advocate for diversity in the workplace. What is it like to be a woman in a non-traditional field? You have to have a thick skin, you have to be the Energizer Bunny and you just have to power through it. And what’s important I think for women is that we need our male supporters. It’s very different when I say we need gender diversity. When Andy (Andrew Kendall) says we need to improve our gender diversity, it sends a very different message within the organization. There is a lot of institutional stereotyping that is changing over time, but it’s still not there. You see more diversity on the vendor side, but not so much in the institutional utilities. What’s nice to see is that in the industry, conferences are putting more of a focus on having diverse panels. How do you navigate the challenge of being in charge of a largely male organization such as the LADWP Power System? I don’t want to come across my way or the highway. I build consensus and I build my team. I earn their respect. When I come into a place I don’t make wholesale changes – I want to learn the lay of the land first. Here, I think I’ve done a good job of coming in and gaining the respect of my team, recognizing the strengths and weaknesses and acknowledging contributions from your team members. That’s the key: it’s the team, it’s not me. I also recognize you’re only as good as the people you surround yourself with. So you surround yourself with successful, hard-working, technically capable people, and the sky’s the limit. You are a role model for women here at LADWP as well as younger women who aspire to careers in STEM. What advice do you have for women either starting out in their careers or working to advance to higher levels in management at their organizations? Be flexible. Don’t map out your path. Because if I mapped out my path when I started, I’d be completely wrong. And I hear that from women all over. I am a finance person, I’m a CPA, and here I am in the Power System. But also I had one particular man who was supporting me when we both worked at Riverside Public Utilities. Dave Wright (LADWP General Manager) was one of my biggest supporters. So I say get your name out there, get your face out there. Raise your hand and volunteer. But then if you do, don’t let them down. Meet your commitments, go above and beyond.